I originally created this page to be used as a checklist but I thought it might be more useful as a summary of all the content on this website. Either way, I hope it is helpful! Important note: This is only a summary of how I trade stocks based on some of the information on this website. You still need to study the other pages to get the most out of this trading method. Let's get started with market timing. Use the S&P 500 to time your trades to the market with Williams %R at a 3 period setting. You can also use the RSI indicator if your charting package doesn't have Williams %R as both give similar signals. You are going to use the 2 moving averages on the chart of the S&P 500 to tell you whether you will be focusing on long positions or short positions (trend). Then you will use Williams %R for timing. For long positions, the 10 SMA must be above the 30 EMA. For short positions, the 10 SMA must be below the 30 period EMA. The 10 SMA is above the 30 EMA on the S&P 500 and Williams %R is oversold - look to buy stocks. The 10 SMA is below the 30 EMA on the S&P 500 and Williams %R is overbought - look to short stocks. Look at the hourly chart on the S&P 500 for bullish or bearish patterns. It's also helpful to drill down to the 15 minute time frame. Look at the VIX to identify extreme market readings. Note: Only use these market timing rules to establish new positions - not to exit positions. This is for long positions only. Reversed for short positions. The trend is up with the 10 SMA above the 30 EMA. The stock is in between the 10 SMA and 30 EMA (Traders Action Zone). This stock is in a stage 2 uptrend. The stock is above the 200 period simple moving average (SMA). 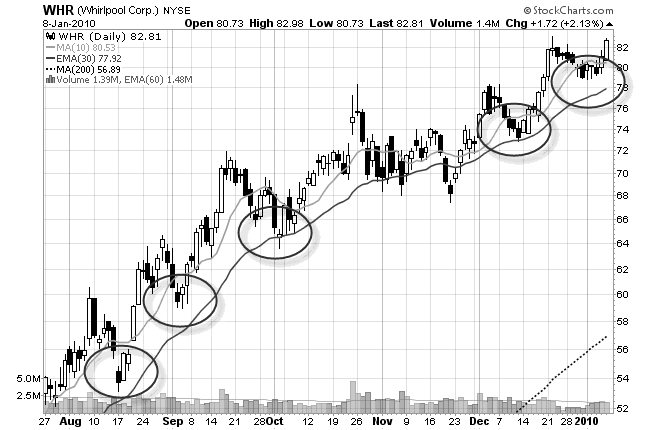 The stock has 2-3 consecutive down days (pullback) with lower highs. The stock has a bullish candlestick pattern for today (hammer, engulfing, piercing), and/or traded over the high of the previous day. The hourly chart matches your expectations on the daily chart. The stock is not coming out with an earnings release within the next couple of days. This stock is trading at or close to a support level. This is for managing your money and your trades. Do not risk more than 2% of your money on any one trade. Use this number to determine how many shares you should buy. For swing trades, trail your stops under the current days low or the previous days low  whichever is lower. Aggressive traders can sell when the first bearish candle develops. If the stock is at the beginning of a trend, consider selling only ½ of your position when stopped out. Trail your stops on the remaining shares under swing point lows until stopped out. This chart shows what you are looking for when scanning for stocks.